It's like this. We're going to Purgatory for a week's vacation visit with daughter and son-in-law. A casual look to see what might be happening while we are there reveals that Friday and Saturday are the two day annual Mushroom and Wine Festival. Scratch Friday, as we arrive late that afternoon. But the mushroom hunting foray on Saturday morning? 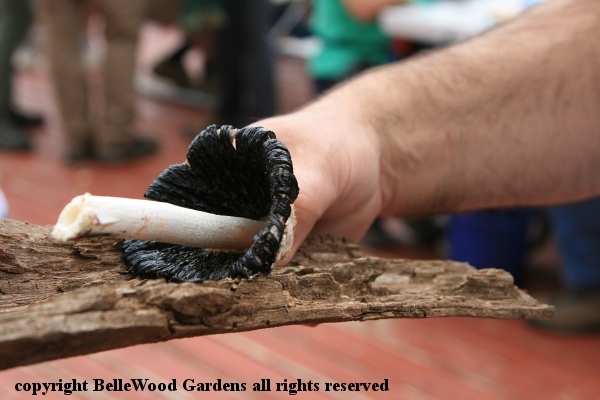 If I didn't manage to attend I'd probably lose my membership in the New Jersey Mycological Association. My pleading pays off and I am allowed to join the group of foray attendees. 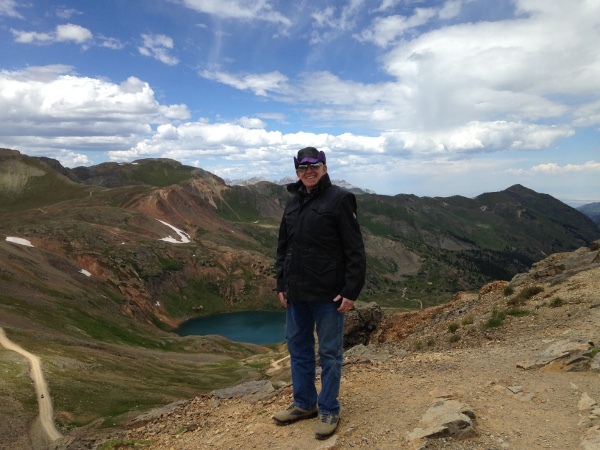 California Gulch Trail outside Silverton. Elevation 12,940 feet. The schedule goes like this: meet at plaza at 9:00am. Board the shuttle buses 15 minutes later. Reach Dante's at 10:00am. 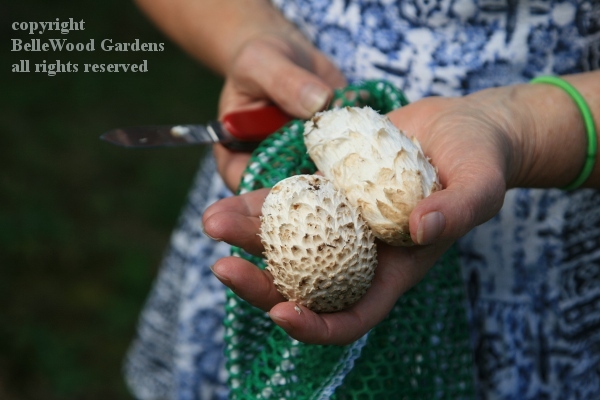 Forage for mushrooms until 12:30pm. Refreshments available on Dante's deck from 11:00am until noon. Then, at 12:30pm take chairlift or shuttle back to base area. 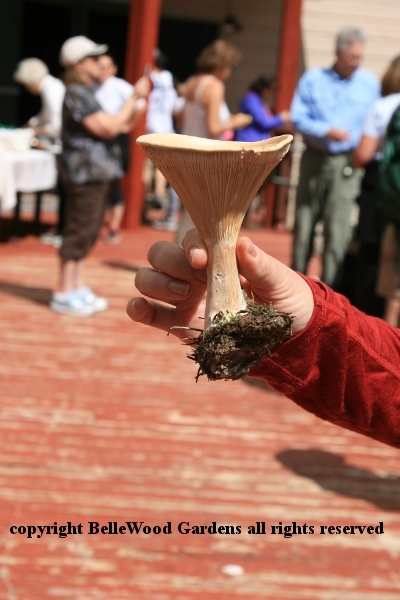 At 9:00am I join the other mushroom foray participants on the plaza behind Purgatory Lodge. 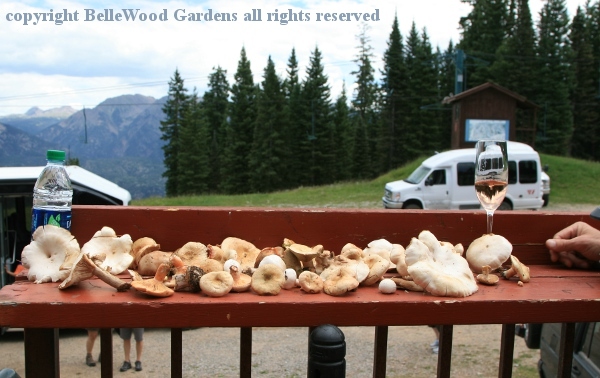 We're parceled into small shuttle buses for the 45 minute ride up to Dante's Restaurant (open in ski season, elevation 10,503 feet) after which we will divvy up into three groups, each with a mushroom savvy guide who will take us off into the woods and meadows, foraging for fungi. meadow patches are thick with plants of alpine strawberries. Their fruit is very small, bright scarlet red, very juicy and sweet. 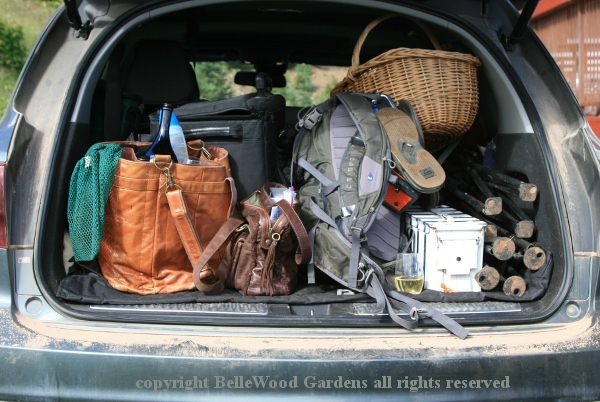 Leah's car is clearly packed for this outing. She's involved with the various events, with her Durango Wine Shop connections. Wearing a T-shirt with mushroom design and a scarf with mushrooms - it is obvious that Leah is enthusiastically in tune with the spirit of our outing. 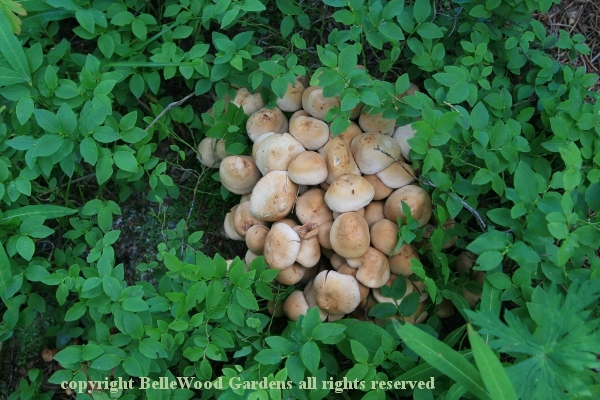 These are what are referred to as LBMs, little brown mushrooms. 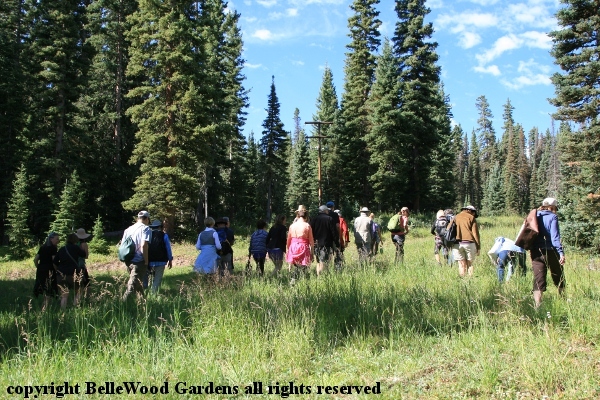 Our group includes people who have joined the foray in previous years as well as first time mushroom hunters. Some have baskets, others have bags. Dean Mullen, guide for the group I'm with recommends baskets. Bags, he tells us, mean that mushrooms on the bottom can be damaged. Any dirt on a mushroom will spread to the others. 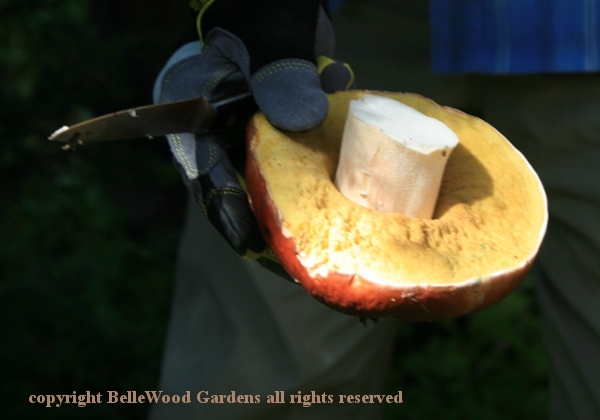 Best to cut the mushroom above the ground, which avoids damaging the mycellium. 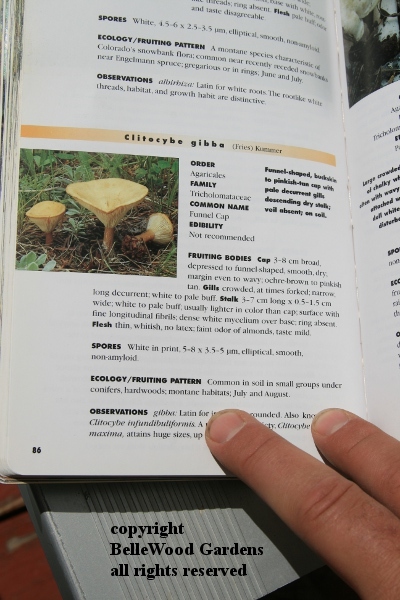 Unless, he adds, you need the just below ground portion and the base of the mushroom as an aid to identification. As I said, people have baskets and people have bags. Some have folding knives, others have what look like small kitchen knives. I just have my camera. 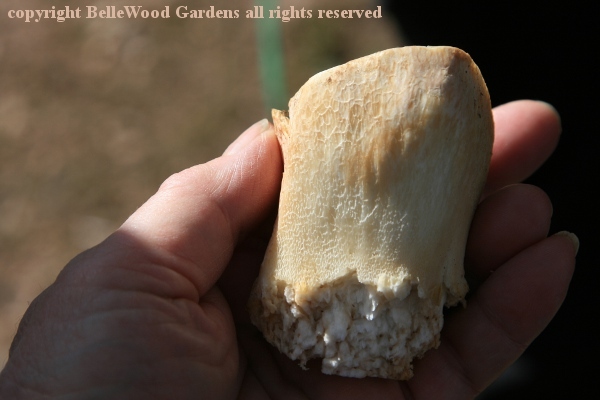 Today's prize is the porcini or king bolete, Boletus rubriceps. and the pores, not gills, on the underside of the cap. 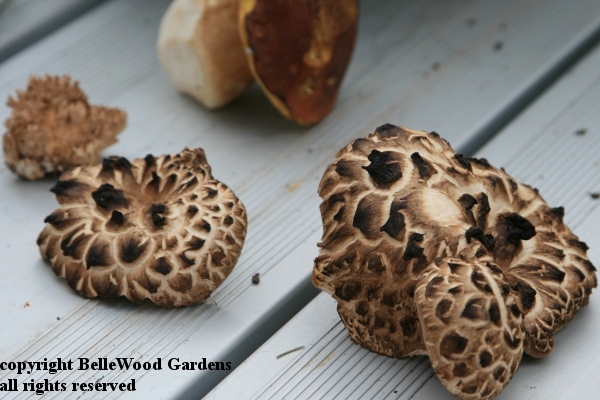 Another find is the hawk wing, also called dryad's saddle or pheasant back mushroom, Polyporus squamosus. New taxonomy could find it renamed Cerioporus squamosus. Young ones are good to eat, not so the older ones. What's this, peeking through the grass and weeds? It's shaggy mane or lawyer's wig, Coprinus comatus. because inky cap mushrooms quickly deliquesce to black slime. 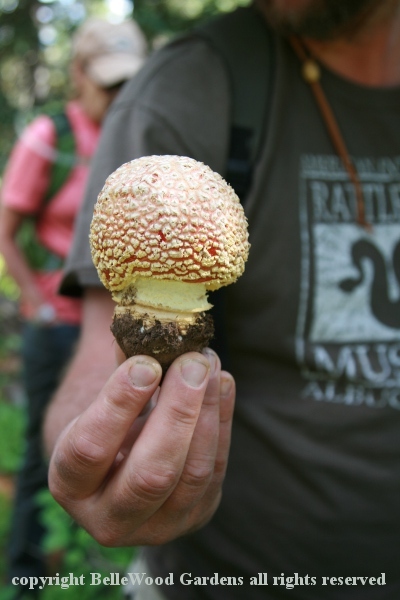 Remember that mushrooms can be delicious, innocuous, or deadly. The patterning here is the remnants of the veil of a death cap, Amanita. Deadly. Eventually we come wandering back to the deck at Dante's. 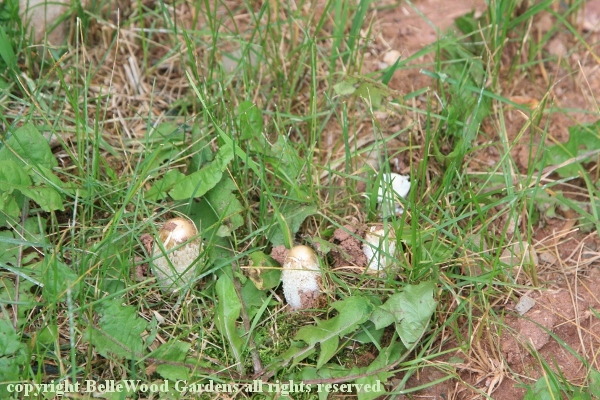 Mushrooms are put out for display. There are light refreshments, and wines - prosecco, rosé, more. 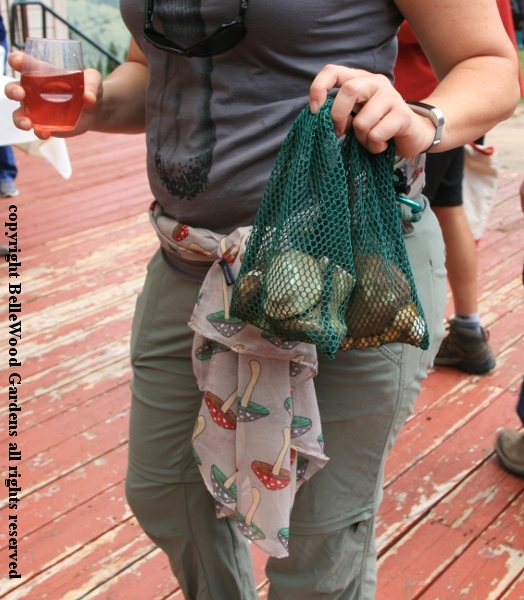 with boletes, and her mushroom printed scarf. 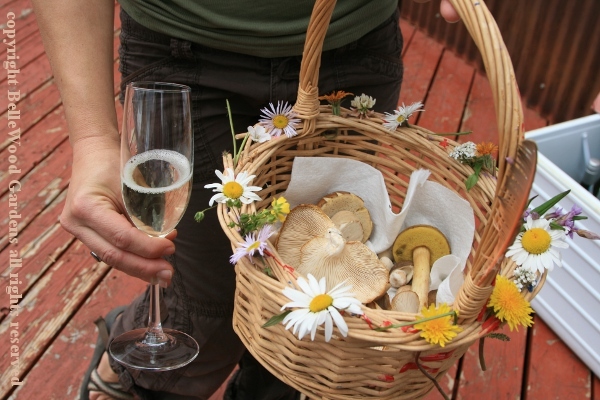 More wine, and more mushrooms in a flower bedecked basket. 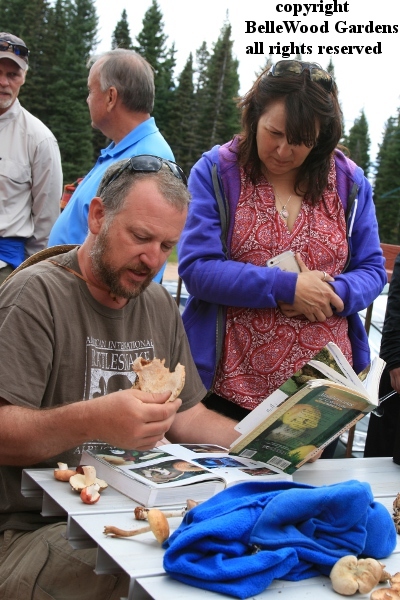 Dean Mullen is patiently identifying mushrooms. Interesting. What might this be? Dean has his finger on the correct page. It is the appropriately named funnel cap mushroom, Clitocybe gibba. 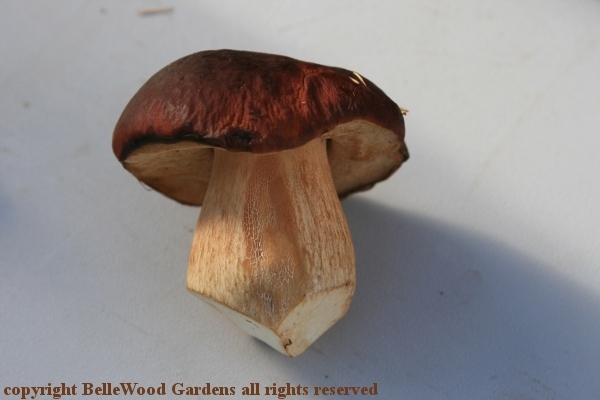 Edible when young and fresh, if not up there with the boletes. It's one of those that's good fried with onions, perhaps in a risotto, or maybe in soup. Some of us are departing. Choice is to shuttle bus down or take the chair lift. And then this afternoon there will be another event, a tasting of six small plates prepared by Durango restaurants, and wines from Durango Wine Shop. What a wonderful day in Purgatory!